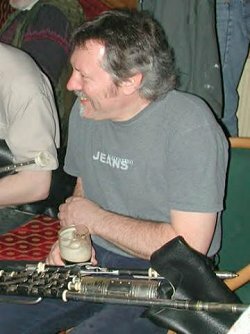 The death in a car accident of Dave Williams at the age of 58 is probably the biggest loss to the world of uilleann pipe making since the death of Leo Rowsome. Born in Cleethorpes Lincolnshire, Dave trained as a civil engineer and worked in the oil industry before taking a course in instrument repair at Newark College. After this, he set up his workshop at the end of his garden in a small terraced house in Newark and at the end of the 1970s, started on a remarkable career making uilleann pipes and flutes. He married Rose Barton in 1983 and moved to Spilsby where he worked in an old army bus for a couple of years before setting up a proper workshop in the grounds of the old school house. When the couple divorced in 1994, Dave set up his workshop on the Waltham Windmill site and bought a flat nearby. Dave enjoyed the craic of good company and it was always a pleasure to visit him at his workshop or have him stay for a weekend of music. He was equally happy to discuss the finer points of reed making, or recount tales of wild nights of music and fun with the huge numbers of friends he made through his music. Wherever he went, Dave was welcomed and everybody who met him would have agreed that he was a complete gentleman. He was a big man with a huge passion for life, which he lived to the full. Dave was devoted to his family and loved his native Lincolnshire Wolds. He also enjoyed travelling and took regular cycling holidays in France, but he will be best remembered with his flute to his lips and a pint of Guinness close by. His craftsmanship was second to none, and every instrument he made was a work of art, beautifully finished and wonderfully proportioned. Dave's woodturning was excellent in blackwood or box and the finish on the metal work was bold and very impressive. His workshop was always neat and tidy; tools were taken up as needed, then promptly returned to their usual position. He used an engineer's lathe and had a range of tools for specific jobs, many of which he had made up specially by a local toolmaker. Dave was a first class reedmaker and his sets were always perfectly in tune and well balanced. He was always keen to build customised sets and took great pleasure in overcoming the problems associated with one-off requests. Many of his sets were silver plated and engraved on the mainstock or bass drone sound box. In the mid '80s he made a couple of sets with four regulators for customers in France. He responded to modern demands for sets in stainless steel and recently completed a set totally mounted in steel. While best known for concert pitch sets he also made some fine flat sets pitched in C or B as well as many concert flutes, including two wonderful instruments pitched in Bb. He was meticulous in his study of older sets of pipes that came to him for renovation. Throughout his career he made detailed notes of every set that he handled and spent time working out what changes had been made over the life of a veteran instrument to restore it as closely as possible to its original condition. 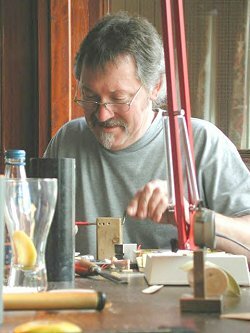 Dave documented some of this work and famously published an extremely informative article on the research he did into the all-silver set of pipes built for Felix Doran. He had planned a similar article detailing the renovation of an Egan set, which he carried out a couple of years ago. Always innovating and adapting in the light of experience, he was probably at the height of his power when he died. His instruments are played by many professional players and no doubt in generations to come they will continue to give pleasure to player and listeners alike. Dave is survived by his son Rowan, brothers Tom and Clive and his mother. Our thoughts are with them at this sad time.